This 56 page book was created with the unique features of very young learners in mind. Small fingers. Limited vocabularies. Developing motor skills. Short attention spans. 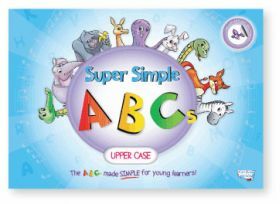 • Large, upper-case, bubble letters and easy-to-follow stroke order guides. Great for tracing with fingers, pencils, or crayons. • Two easy-to-gesture, easy-to-learn vocabulary items for each letter. • "Getting Ready" skills pages, review pages, and cut-and-paste activity pages. • 52 colorful vocabulary stickers. Super Simple ABCs is formerly Super Simple Phonics.